Model BME58278-100 is a Class AB linear amplifier that operates over the full 500 to 2700 MHz frequency range with output power of 100W minimum into a 2:1 VSWR. 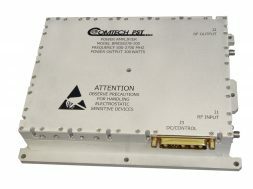 Features include 90º quad combiners and wideband operation. The amplifier is very compact (8 x 6 x 1.8”) and weighs less than 5 pounds.